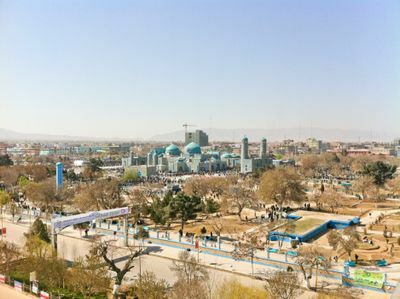 Mazar-e Sharif (مزار شریف), officially called Mazari Sharif and also Mazar-i-Sharif, Mazar-e Sharif, Mazar-e-Sharif, even Mazar Sharif or just Mazar is a city in Afghanistan and the capital of Balkh Province. It has a population of nearly 200,000 people. With a population of more than 300,000, Mazar-e Sharif is the 4th largest city in Afghanistan. It was founded in the 12th century after a local mullah dreamt of the secret site where Ali bin Talib, the Prophet's cousin and the fourth caliph of Islam, had been buried (outside of Afghanistan most Muslims believe that Ali is buried in Najaf, Iraq). A shrine, which was later rebuilt as the Blue Mosque, was constructed on the site and the town of Mazar grew around it. The town, however, continued to live in the shadow of its larger neighbor, Balkh, until that city was abandoned due to disease in the mid 19th century. As a result, Mazar assumed the role of capital of the region - a position it has maintained ever since. From Kabul can take as little as 5 hours, via the Salang Pass. The road has been improved and is possible with a normal car. Mercedes buses leave Kabul around 04:00 to 05:00, arriving in Mazar around 13:00 to 15:00, and cost 400 Afg. It is also possible from Sheberghan, Kunduz and neighbouring Uzbekistan. The back road from Herat via Maimana is a very rough 3 day journey in a landcruiser, and is no longer considered safe. Mazar-e Sharif Airport (IATA: MZR) is located 9 km east of the city, a journey of 15 minutes by taxi. Kam Air flies on Sundays and Thursdays to/from Kabul (leaving Kabul at 09:00, returning at 14:30) and have ceased direct flights to Herat. Kam Air also flies intermittently to Mashhad, Iran. Safi Airways also flies between Kabul and Mazar for around 40 USD one way. The Ariana flights between Kabul and Mazar have been suspended due to low demand. Turkish Airlines  offers direct flights to Mazar as of January 2014. The airline flies to Mazar from Istanbul 3 days per week (Wed, Fri, Sunday) and from Istanbul to Mazar 3 days per week (Tues, Thur, Sat). Airfare is between $600 and $950 USD. Taxis are plentiful and should cost 30 Afg or less around town. Negotiate a price before setting off. In the way of sights Mazar has little to offer the visitor other than the Blue Mosque - although some of the modern monuments built atop traffic circles are worth a photo. Shrine of Hazrat Ali (the Blue Mosque) marks the burial site of Ali bin Talib, the Prophet Mohammad's cousin and the fourth caliph of Islam. At night the mosque is lit by coloured lights. However, due to many homeless sleeping in the surrounding park, it is not advisable to walk around at this time. Day trip to Balkh, (30 minutes by taxi). If you are in Mazar it is well worth the effort to go to Balkh - there is a good tarred road and the area is considered rather safe in comparison to the rest of the country. However, since about 2010, the West of the district and since 2012 also the city itself have seen increased security incidents. Best to put aside half a day and make sure you get back to Mazar well before sunset. If possible, have someone you know and trust accompanying you. Mazar is surrounded by beautiful Mountains on two sides. The mosque is open for daily prayers. sufi hafeez, maudaha , hamirpur u.p. india, ☎ 0092346907554. Afghanistan International Bank (AIB)  has a branch in Mazari Sharif. Kabul Bank  has a branch in Mazari Sharif. Azizi Bank  has a branch in Mazari Sharif. Western Union  has several branches in Mazar-e Sharif. Between the Farhat Hotel and the Blue Mosque there are food stalls on both sides of the road. Bagels with green vegetables, tomato and french fries are especially good. Fruit shakes, soft drinks and tea are also available. Stalls close around sun set. Delhi Darbar  about 1 km north of the shrine, on a side street opposite the military hospital. Serves good Indian food, and alcohol is available to non-Afghans. It's known locally as the 'Indian Hotel'. Freshly made fruit slushies. Banana shakes with almonds and dates are delicious, and the persimmon version looks equally alluring. Several stands are set up near the Aamo Hotel, as well as other spots around the shrine. Alcoholic drinks are available at the Indian hotel (Delhi Darbar), for non-Afghans only. Local hotels offer multi-bed rooms from 10-20 USD with shared bathroom and toilet. Cheaper rooms have worse toilet facilities. Aamo Hotel on the south side of the shrine, 050-2478, has okay rooms with 3 or more beds starting at 15 USD (can be bargained down to 10 USD) with shared toilets and showers. Farhat hotel, Darwaza-ye Balkh, (two blocks west of the shrine). Tel:+93 70 503-177 - rooms from $40 USD (negotiate) with attached bathroom and television (CNN, BBC World). Barat hotel, (east of the shrine). Tel:+93 70 502-235 - a modern hotel with nice rooms and shared bathrooms - from 30 USD. Royal Oak Hotel, (Next to the governor's house, in Darwaza-ye balkh), ☎ +93-79-9383127. Aimed at high-end international guests this Kabul style guesthouse is safe and includes a nice restuarant. This hotel is now the Renaissance Hotel - but is still also known as the Royal Oak - both names are on the gate. Prices per night from $70. Kam Air  flies to Kabul on Thursdays at 2pm and to Herat on Mondays and Thursdays at 11:00. All flights costs 2500 Afg. They have an office 1 block north of the shrine on jad-e Maulana Jalaluddin Balkhi, or a travel agent east of the Aamo Hotel books tickets for the same price. Ariana  also has an office next door to Kam Air, but all of their Mazar flights are currently suspended due to low demand. Shared taxis head to the Uzbekistan border - taking 30 minutes on a good tarred road through the desert. To drive your own vehicle will require completing some paperwork with the Uzbek embassy in Kabul. Dunya Internet Cafe on the first floor of Aamo Hotel (on the south side of the shrine), has a reasonable connection and costs 50 Afg per hour. Aside from the inherent risks faced by coming to Afghanistan in such a time of turmoil, Mazar remains relatively peaceful and safe for travelers. Bearing in mind that things can change very quickly, avoid walking at night if possible, always remain friendly and upbeat, and keep aware of your surroundings. Treat police with kindness and smiles even if they aren't showing you the same respect - unfriendly passport checks are not unheard of. Show respect for the religion, culture and people's customs. Humility is appreciated. This page was last edited on 11 May 2015, at 22:07.